It’s funny how much children want to be outside. Even if it’s minus a million degrees celsius. Saturday was one of those days. Standing at the front door and banging on it repeatedly while looking over her shoulder and stating, “unnh! unnh!” rather earnestly. When asked if she wanted to go outside, DD jumped up and down with glee. Ya, I can take a hint. So we bundled the family up and went to explore the wide open spaces of the good old outdoors. As you can expect, DD had a blast. It was just. Way. Too. Cold. 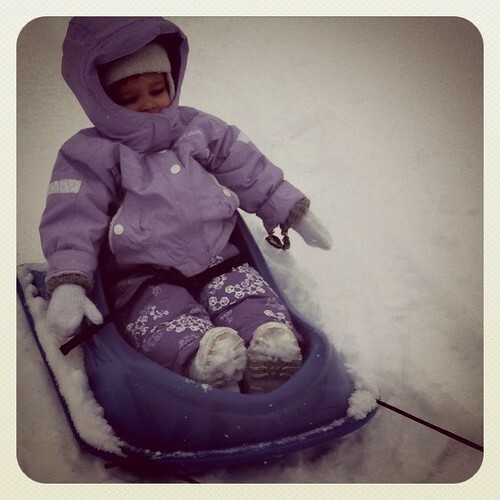 Thank goodness for snowsuits and sleds.